A massive explosion of coins is the goal in Volcano Eruption Extreme. Created by NextGen Gaming, this video slot might have a prehistoric theme but it can deliver some bang up to date action courtesy of the free spins with stacked and exploding wilds. Play this 5 reel, 25 payline game on your PC tablet or mobile from between 25p and £62.50 per spin. NextGen Gaming has created an impressive looking game here. There’s a comic book feel to the visuals. With plants, mountains and a mighty volcano in the background, you’ll see lower value A to 9 symbols made from rocks. The more rewarding symbols are the oranges, monkeys and parrots. Top of the payers is the dinosaur which will get you 20 times your bet if you find 5 in combination. Central to the best action here is the live volcano symbol which is the wild. This can hit on reels 2, 3 and 4 only. Hit 2 wilds on the same spin and you’ll pocket a 2 times bet payout. Land 3 and you’ll trigger the game’s Eruption feature where things can quickly explode into life. The Eruption feature awards a payout of 5 times your bet plus 5 respins. Throughout the round, the whole of the middle reel is wild. Look out as the volcano can spew out even more wilds on the adjoining reels 2 and 4. This can lead to 3 wild reels on each respin if you’re lucky. We found the base game action a little slow but the Eruption feature can deliver some potentially spectacular action thanks to the extra wilds that it brings – in total, throughout the feature, there are wins of up to 3,289 times your bet up for grabs. Despite its theme, the volatility here isn’t quite as volcanic as you’d imagine. The medium variance provides a balanced range of payouts. The colourful cartoon visuals are very well-constructed and the sweeping orchestral score matches the epic theme rather well. The range of extras is limited which could make the game a bit too straightforward for some tastes. 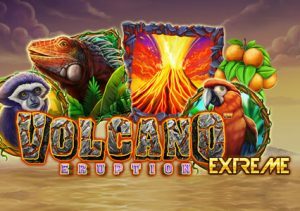 Volcano Eruption Extreme is all about the Eruption feature. Get on a roll with all those wild extras and Volcano Eruption Extreme can live up to its name. If the theme is appealing, Quickspin’s Razortooth should do the trick.